Maria Kireyeva: “The diagnosis came as a shock. The rest was like a bad dream.” Photo: Maria Kireyeva. 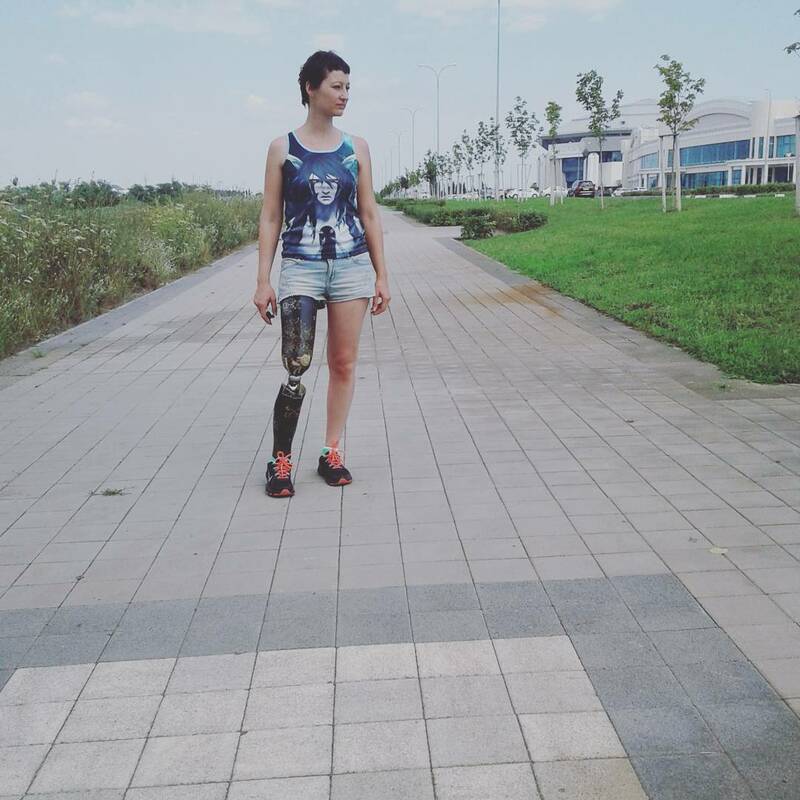 The Instagram account, on which Maria Kireyeva, a young woman from the southern Russian city of Krasnodar, shares the story of her struggle with Ewing’s sarcoma and her life after having a leg amputated, will be an inspiration to others, she hopes. She recounts why she needs her Instagram account. It began three years ago, when I felt a definite numbness in my right big toe. I did not give it much thought then and continued with my normal life: bringing up my children, going to my fitness club, doing work around the house. One day, I noticed a lump on my foot. I was told it was a hematoma. Following doctors’ advice, I spent nearly a year putting various gels on the lump, treating it with heat and massages. Then I saw an oncologist, and had an MRI and a biopsy done. The diagnosis – Ewing’s sarcoma – came as a shock. To top it all, they found metastasis in my lungs. I was told that the prognosis was not good. I was diagnosed with stage four of the Cancer. I refused to believe or accept that it was the end. I told myself: No matter, I shall live. What followed was like a bad dream. I required amputation. High-doses of chemotherapy with all the consequences that follow: sickness, hair loss, mood swings, tears. But I had no intention of giving up. We only have one life and it is worth fighting for, even when it seems that the ordeal is too much and things will never be the same. I had my surgery and treatment in Russia, at the Rostov Institute of Oncology. Everything was done at the very best level. International treatment protocols were employed. I received all the medicines free of charge, as part of the national medical insurance. There it was, the long-awaited remission, the victory over illness, my victory! A whole new life was beginning; a life without a leg and without my beautiful long hair. My comfortable and beautiful prosthesis was made at the Krasnodar-based prosthetics and rehabilitation centre Planeta. Alexander Pereverzev, the man who made my prosthesis, has hands of gold. He feels the patient and listens to all their whims. And I had a lot of whims. I set him a difficult task: to restore my previous life, to the extent possible. I remember how I was taking my first steps on my prosthesis three months after the amputation. It was very painful and scary, but at the same time it was fun. I was overcome with emotion because once again I was standing on two feet. I was regaining my independence and freedom of movement. I set up my Instagram account for one purpose: I want disabled people in Russia to stop sitting at home and to start going out. Especially young women. It is particularly tough for them. It is tough to lose a leg. After all, legs are often seen as a symbol of female beauty. It is horrible and painful to realize that earlier you were looked at with admiration, and now with pity. For a long time, I could not pluck up enough courage to go out into the street. I made a long and difficult journey, both psychologically and physically. I trained for eight hours a day, limping around the flat on an uncomfortable temporary prosthesis, after debilitating chemotherapy. When I began going out, I used to fall a lot because our roads leave much to be desired… But still, I continued to train, step after step, bump after bump, overcoming obstacles, I was pursuing my dream: to be able to walk for a long time, and well. Before going out into the street, I would look out of the window to see if there were people there. I felt self-conscious. When I went to the shops, limping, I thought everybody was looking at me because I was missing a leg. When spring came and then summer, and women started wearing beautiful summer dresses and shorts, I began crying, asking, ‘what have I done to deserve this?’ But I quickly pulled myself together, went to a prosthetics company and asked them to make me a beautiful and stylish prosthesis, with patterns and drawings. I made a decision: Let people stare at me, let them point a finger at me, but I will still wear summer clothes: shorts, skirts, dresses. At first, I would only go out for a walk with my friends, but now I go out for walks by myself. Of course people stare, but I think it is normal for a country where disabled people hardly socialize at all. I sincerely hope that things will change. A person is defined not by how many arms and legs they have but what they have in their souls, what they think about. I now look after my family and my home, I drive and I train people about how to walk on prostheses. I particularly try to support those who have been diagnosed with cancer. Neither this diagnosis nor the loss of a limb is a death sentence. Each person has inexhaustible resources of willpower and strength inside them, which can lead them to victory. The crucial thing is to never give up. Published in an abridged form. First published in Russian in Medporal.ru.